Patricia Finney's first novel "A Shadow of Gulls" had already been published when she went up to Oxford aged 18 to study History. While she was still in her first year her book won the David Higham Award for Best First Novel of the year and some fantastic reviews. By then she was also an established broadcast dramatist, gaining particular acclaim with the BBC Radio 3's production of her play The Flood. Patricia's second novel, The Crow Goddess, followed within a year to further acclaim. Patricia Finney latest book for children, Jack and the Ghosts, is due out shortly, published by HarperCollins in the USA and Transworld in the UK. 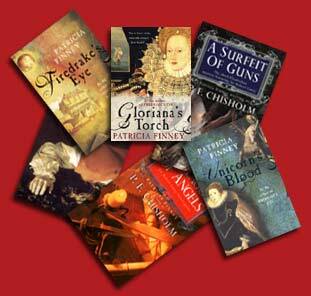 As well as another award-winning radio play ("A Room Full of Mirrors"), she has published fifteen other novels, including three Elizabethan spy thrillers and four Elizabethan crime novels, four childrens' books set in Elizabethan times and the two earlier Jack books - hilarious stories about Jack the daffy (present-day) Labrador dog and his Pack, written in Doglish. Her career to date has also included stints as a newspaper columnist, magazine editor, property developer, hospital administrator, pastry chef, stand-up comedian, film scriptwriter and entrepreneur. She is now back in England after two and a half wonderful years in the south of Spain where she learnt Spanish, a little flamenco dancing and how to drink coffee and cognac at 8.00 in the morning.